During World War II, people of Japanese descent were incarcerated in the Relocation Center under the executive order of President Franklin Roosevelt. 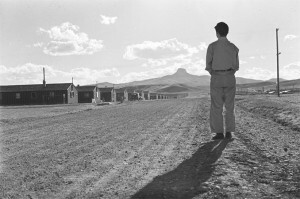 Residents were at the camp from 1942 to 1945, two months after the end of the war with Japan. Indeed, American soldiers came to the front door of their house to order them out. His mother crying and he will nerver forget. Thus, George was born and raised in L.A and simply because they happened to look like the people who bombed Pearl Harbor they were deported. The « relocation center » sounds very inocuous but there were machine guns, armed soldiers, barbed wire.. It was a big euphemism. It was a dark chapter in America story. 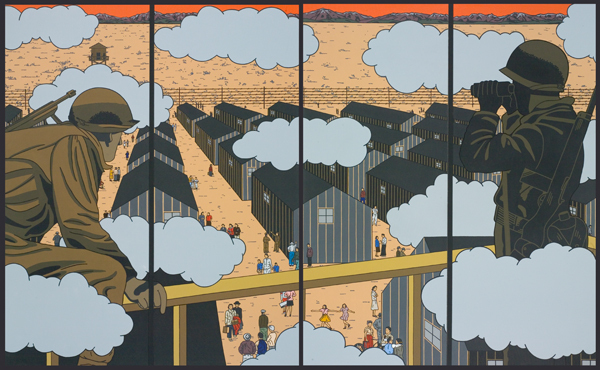 Furthermore, I am going to present you another Roger’s picture which is called American Infamy published in 2008.There is yellow or beige because the scene take place in a deserted landscape and because there isn’t life and the desert is sterile. After, we can see a white cloudy to represent the weather or the smoke created by the machine guns and the red sky could be the violence of the war. Try to imagine two guards in uniforme are constant watch on seattered families in the camp. The guards domineering the families. So, we can see barracks and the camp is fenced by barbed wire for nobody goes out. To finish, we can see a relocation center through a window and behind the guards, maybe because we are pure and simply spectators. On december 7th 1941, the American naval base of Pearl Harbor was attacked by the Japanese. 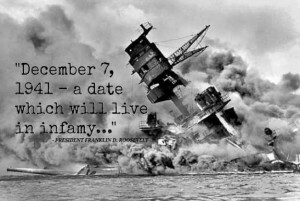 The day after the bombardment, President Franklin D. Roosevelt asked Congress to declare war on Japan and Congress approved. Three days later, Japanese allies Germany and Italy also declared war on the United States, and again Congress reciprocated. More than two years into the conflict, America had finally joined World War II. So that you understood better, I am going to present you an interview. In this recording, we can hear a man with his daugther who speak about the attack of Pearl Harbor. The girl she can’t locate Pearl Harbor, indeed she doesn’t know because she is very young and she doesn’t know much about geography. She feels unconcerned about this attack but her parents aren’t Americans citizen yet, so, her father feels threatened and he anticipated trouble. He is worried and he feels they might be detained or even sent back to Japan. But, after speaking with his schoolteacher, she changes her mind. She feelts aware of her Japanese origins, she feelts threatened and nervous.